My Dream Canvas: A home wih a heart in Singapore! A home wih a heart in Singapore! I am in love with Shilpa's home! Shilpa has recently moved to Singapore with her husband and daughter. They are still in the process of unpacking and settling down. I am delighted that she agreed to share pictures of her new home with My Dream Canvas. 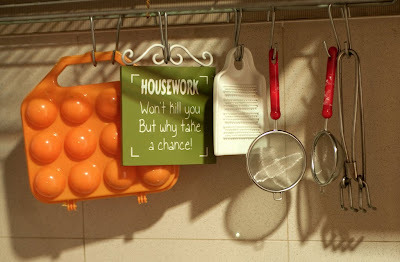 In Shilpa's words," I like my house to be neat, but feel lived in. I tend to favour traditional over modern design elements, and like to use mostly natural materials. With most of our furniture, it has been love at first sight. 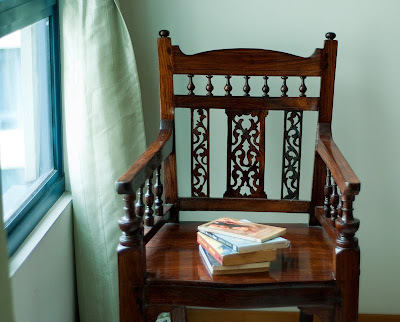 Most pieces are made of solid Indian rosewood or teak wood and lend a warm quality to our house. I like furniture with some history behind it. 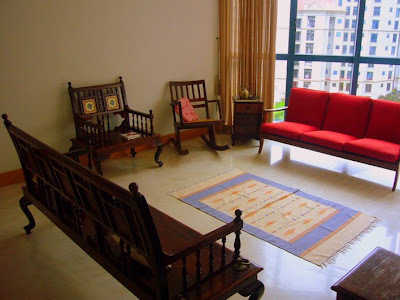 The swing set is fashioned from rosewood rescued from an old Chettinadu style bed. The teak cupboard that we currently use as a crockery cabinet is about 50 years old. The sofa was a garage sale find here in Singapore and spotted by my husband. I was told it originally belonged to a Peranakan grandmother. The moment we saw it, I knew I wanted it in our house. 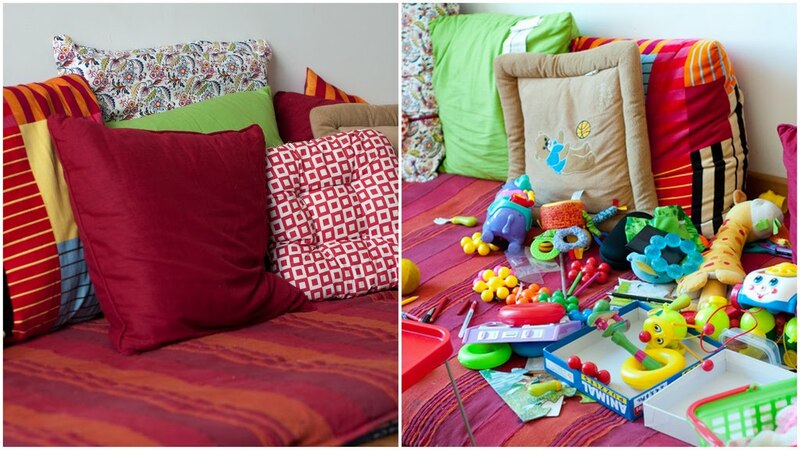 Some polish and vibrant upholstery later, it is my favourite place to relax." Shilpa's beautiful green corner. Her talents as a photographer is clearly visible here. 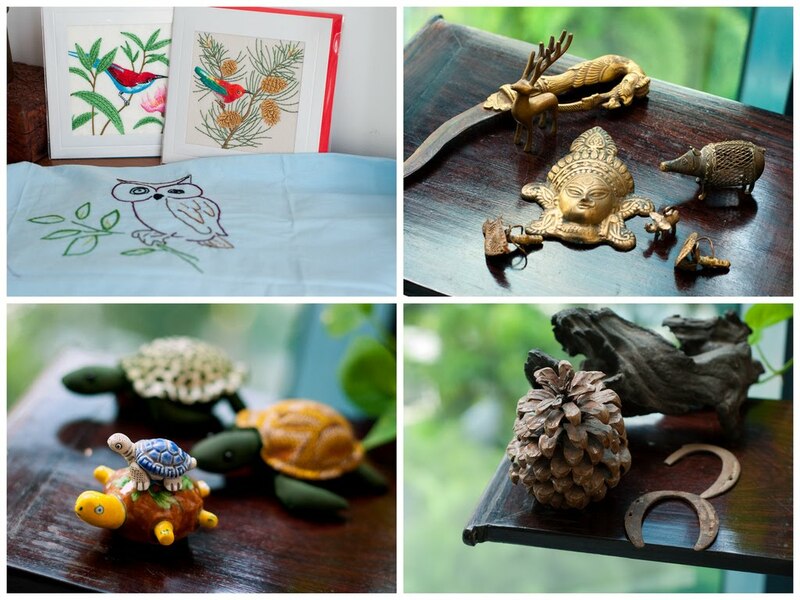 Shilpa is also an artist, and the owl here is made by her. Shilpa says," most decor items are handmade treasures from family members. I like waking up and looking at them as it reminds me of the people who made it for us. 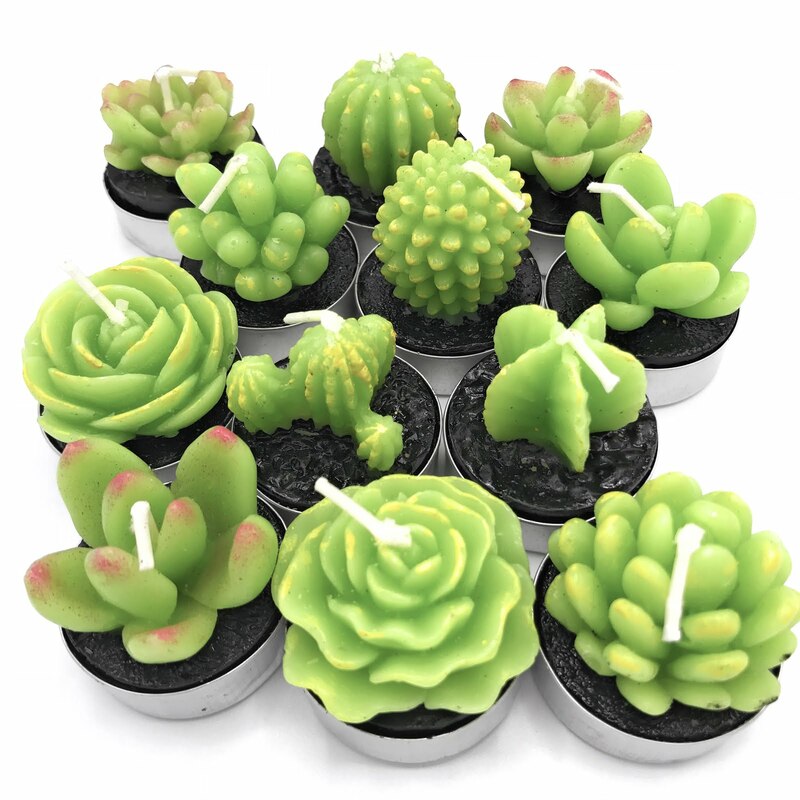 It makes us feel surrounded by their love and that, I feel, brings positive energy into our home. Precious things collected on treks - the horseshoes are especially special. My love for animals and birds is reflected in collection I have of them in brass, wood and fabric - some are flea markets finds, some from our travels and some handmade." 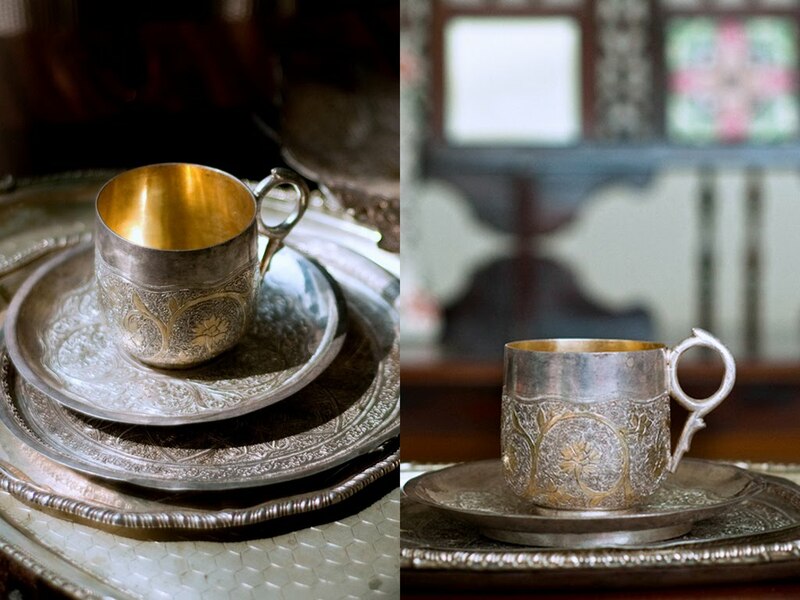 Here are some family heirlooms, like this lovely silver passed down from her husband's family. Her lovely living room.......the furniture is gorgeous. 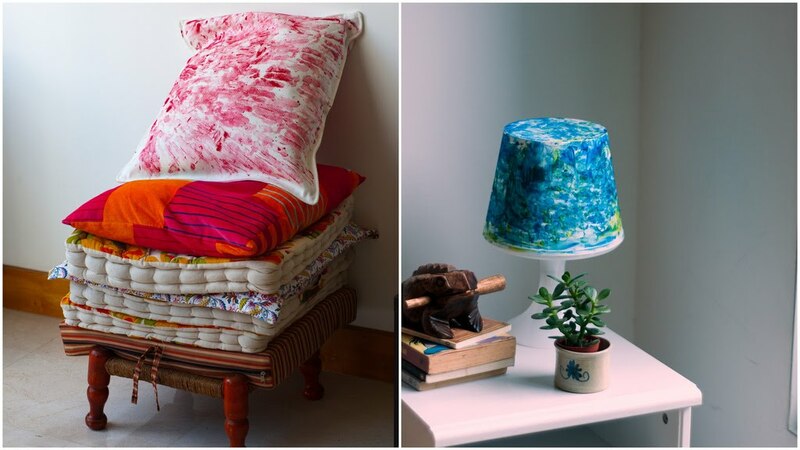 A finger painted cushion cover and lamp shade by Shilpa. 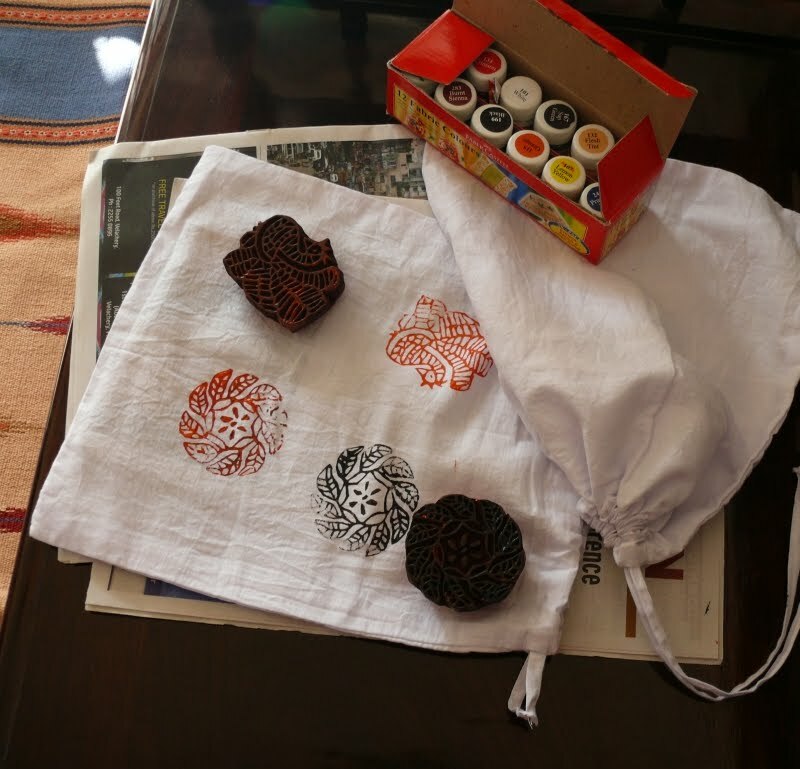 A fun afternoon at home, where Shilpa uses wooden printing blocks to print cotton drawstring vegetable bags, from leftover cotton diaper material! 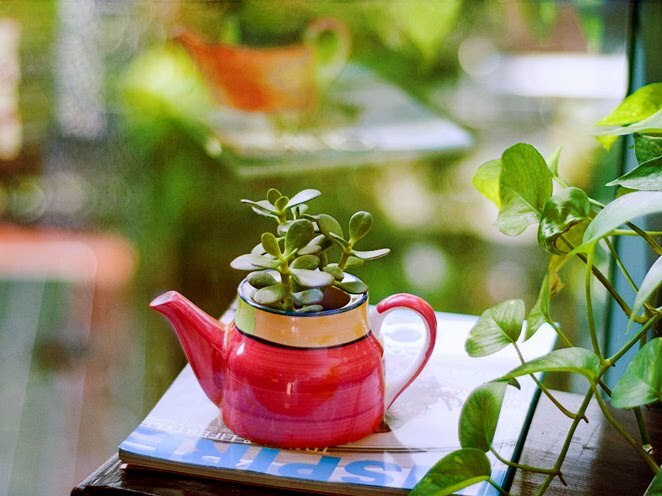 Shilpa's warm touch and creativity is evident in every corner of her home. I do hope you have enjoyed visiting her pretty home. Gorgeous, warm home! I'm amazed at the talent out there!! Love the block print art and those little turtles! Thank you for sharing, Shilpa. Great post Anu! ohh same here am nostalgic about the Amar Chitra katha too. thats a very cosy home with oozing creativity. Welcome to Singapore :)...Your nest is lovely..a cozy and creative home! 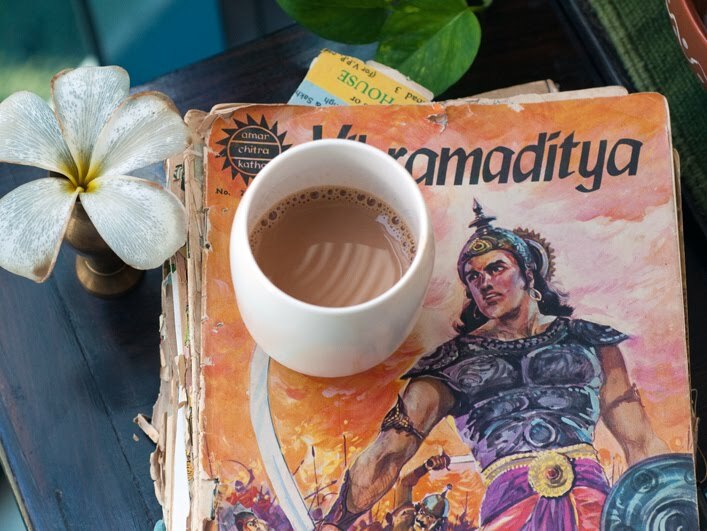 !..and yes,my hubby's childhood Amar Chitra Katha collection is right here in Singapore!! :)...passed it on to our two brats! !..loved your block art.. Thanks Anu for featuring our home and thank you everyone for your lovely comments. what a beautiful home !!!! and such lovely ,glossy pics !!! ... very warm and cosy indeed ! what a difference it makes when you make stuff with your own hands for your sweet abode! Shilpa...loved your home! very pretty home!! warm and inviting!! lovely home dear shilpa.i am glad that we know each other ...taking pride..
am glad I got to see this! Definitely a home with heart - I love the silver and the wooden block prints!